Written, co-produced, and directed by Christopher Nolan, “Dunkirk” marks the tenth full length feature for the acclaimed filmmaker as well as his first historical project. A few members of the cast are Fionn Whitehead, Tom Glynn-Carney, Jack Lowden, and “One Direction’s” Harry Styles. Additionally, Kenneth Branagh and Mark Rylance are featured in supporting roles alongside Nolan-regulars Tom Hardy and Cillian Murphy. Speaking of Nolan-regulars, Hans Zimmer once again provides the soundtrack here, following the collaborations of “Interstellar”, “Inception”, and “The Dark Knight” trilogy. 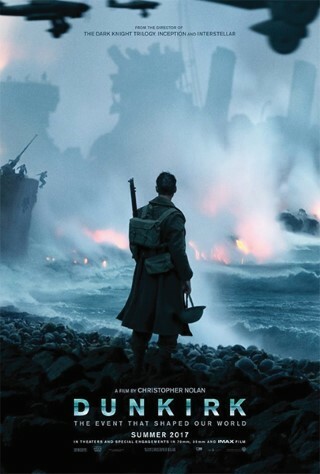 As a huge fan of all of Christopher Nolan’s work, I just couldn’t wait to see what my favorite film director would bring to the table with this epic war project. Clocking in at a run-time that is surprisingly under two hours, “Dunkirk” is one of Nolan’s shortest movie to date. Nonetheless, the film finds enough time to portray a tragic event of the Second World War that is not too well known here in America. Between May 26 and June 4 of 1940, the Allied forces of Belgium, Britain, and France became surrounded by Germans and trapped on the beaches of Dunkirk, France. Providing three intertwined story-lines from the perspectives of land, air, and sea, “Dunkirk” chronicles the epic battles and massive evacuation that took place in the titular harbor. “Dunkirk” is truly unlike any other war movie that I have ever seen, largely due to the fact that there is very limited dialogue and little to no characterization. Personally, I found that to be a bold, effective form of storytelling that made for a totally immersive film experience. It felt like I was a part of the tragic history I was viewing and in my opinion, illustrated the oftentimes dehumanizing effects of a large group of people fighting for survival. However, others may feel differently, as it can be hard to follow a story like this without being placed in the shoes of a fully fleshed out main character. While the character and storytelling decisions of “Dunkirk” may be controversial, there is no denying the technical expertise on display in this movie. The film is shot beautifully, with some incredible wide shots that ground the settings in reality. While there are enough well-paced battle sequences to keep the plot moving, there is a seemingly endless amount of pure tension moments to supplement all of the action. On top of that, Hans Zimmer delivers yet another epic soundtrack for director Christopher Nolan that takes the film to a whole new level. Overall, I think that “Dunkirk” was a necessary story to tell and a fresh take on war movies that fans of the genre can’t afford to miss.